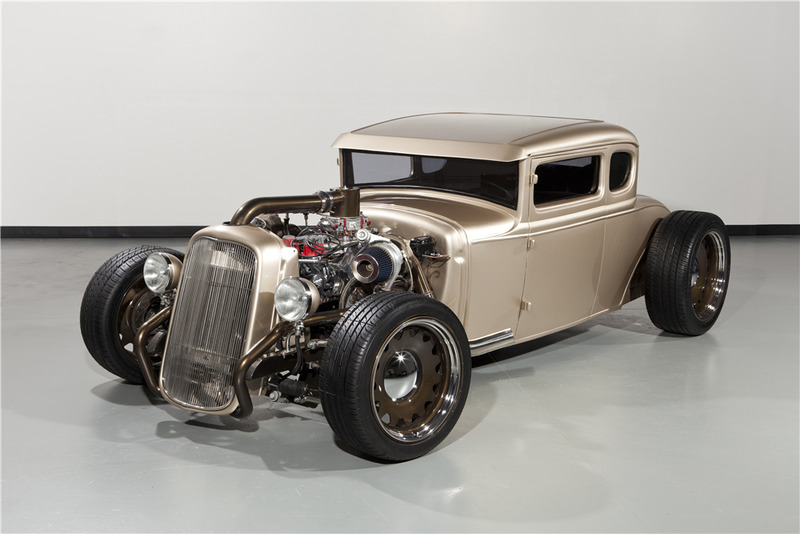 Built by Weaver Customs, the "Twisted Mistress" is a modern-day Model A. A twin-turbo 401ci 8-cylinder Windsor engine backed by a C6 automatic transmission with a 3,500 stall converter going back to a 9” Ford rear end sporting 3.70 gears motivates this hot rod. It features a custom-built chassis and suspension. No panel was left untouched during the rotisserie build. It has been chopped, channeled, smoothed and shaved. Flush-fit doors complement the body modifications on this custom hot rod. It rides on 18” front and 20” rear Detroit Steel Artillery wheels wrapped in Toyo Proxie tires. The interior is trimmed in Hyde’s Italian leather. In 2018 its accolades include being a feature vehicle on Hot Rod Magazine's Power Tour, as well as an ISCA winner and a Street Rodder Top 100. The “Twisted Mistress” was displayed at SEMA 2018 by Prestone.